What is the Value of Saving Established Perennials and Shrubs during a Home Renovation? 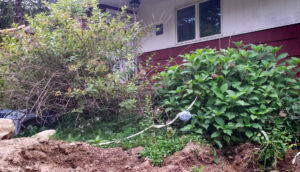 Is it worth saving shrubs before your renovation begins? 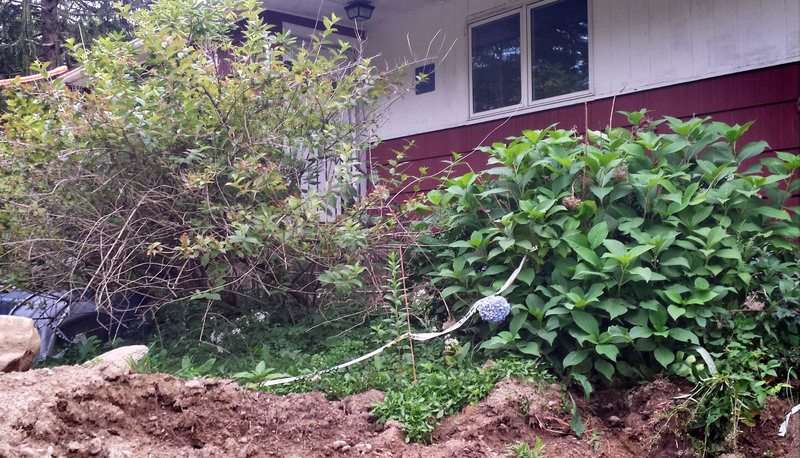 Wygelia and Hydrangea macrophylla shrubs will be saved at this Sharon, MA home, but how would you decide? Imagine that when you were a child your parents loved gardening, and over time you helped your family create secret gardens and woodland paths that changed daily with new sprouts pushing up from the earth, turning into a bounty of ever-changing blooms, and you loved every petal and leaf of it all. Now, imagine that you’re middle aged and still living in that same beloved 1950’s ranch, but you’re ready to tear it down to build your dream home, and save as many of your family’s horticulture heirlooms as possible. You’ve come to appreciate that many of the plants your family selected and nurtured are quite unique. Sharon, MA homeowners in this situation called in Carol Lundeen, owner of Garden-911 Boston, for landscape renovation consulting and horticulture services to help them make their decisions. The excavation crew was expected to start in a couple of days, and we needed to establish priorities, make a plan, and get a move on. First, we contrasted the emotional and financial value of various plantings. The client had many childhood memories in specific areas of the property, especially around the patio, past the boxwoods (Buxus sp.) and up the path into the woodland, past the doll’s eyes plants (Actaea pachypoda). There was also the giant Wygelia whose branches arched over the front door entryway, and if it could talk it would tell more than half a century of stories. I reminded the client that financially it costs money to remove existing plantings (and manage their debris); to lift and temporarily relocate and care for existing plantings, then replant and reestablish them; and to purchase (plant selection and delivery) and install and establish new ones (site preparation and irrigating). Existing shrubs on the property were mostly well established beauties that would be costly to replace with same-size specimens, and perennials seemed to be everywhere. This client kept her sense of humor and broad perspective of the past and future, she asked lots of questions and we figured everything out together. While he was already on the property, we had the excavator dig a trench in well-protected areas in the front and rear of the property, and with machines he lifted and placed many of the larger shrubs into the trench. Garden-911 Boston carefully backfilled by hand, irrigated, and mulched these specimens for the best possible outcome. Perennials were dug together by hand by the client and Garden-911 Boston owner Carol Lundeen, and we placed them into a long-overgrown garden area that we first had to clear of all manner of wild invasives vines and weeds, fallen-down raised beds and tangled chicken wire as the mini-excavator went to work nearby. Eventually, as in all renovations, comes a period of being okay with not knowing when enough is enough. 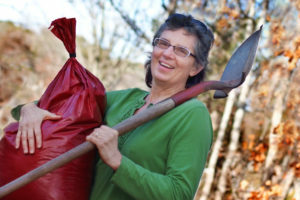 But most all very important plantings are safely stashed for the fall and winter, and spring will bring a new house and new possibilities for the client’s heirloom plants to re-establish in their new places. We’ll be working on the design together over the winter. This entry was posted in Design, Invasive plants, Landscape, Mulch, Perennials, Sharon MA, Shrubs and tagged Buxus, design, landscape, MA, moving, Sharon, shrubs, Wygelia on September 26, 2018 by admin.